David has a wonderful eye for choosing subjects and here he concentrates mainly on interiors. Firstly an old forgotten corner of a barn with farm implements and light streaming through the door, then the interior of a boat builders yard with work in progress. As a slightly simpler subject he paints in a farmyard - an old barn, trees and lots of atmosphere. . Surprisingly, there are only a few passing references to light in Light Effects in Watercolour, the latest video from David Curtis. Whilst this is a little disconcerting, especially so since two of the three locations he chooses are interiors pierced by sunlight, ultimately it detracts from neither the quality of the video nor Curtis's painting. He is certainly no Caravaggio, George de la Tour or Rembrandt, for his translations of light do not even approach their chiaroscuro; Curtis never overstates light and shade, saying that he aims to maintain the transparency of shadows. As a result, the appeal of his work is largely in its subtlety of colours and tones, something which this video illustrates particularly well. There is a lot to be learnt from watching an artist at work. Arguably, a painting should speak for itself, and whilst Curtis's work is no exception, his almost continuous commentary describes what he is doing, if not always why and how he's doing it. The comments are a welcome contribution, for what he has to say is frequently insightful and always helpful and, as he declares, it's worth talking as one paints for it helps to sort out problems. But the experience of the painting process is what makes this video so valuable; the close-ups of Curtis's brushwork and colour mixing make this as immediate an experience of painting as any video can. Furthermore, the editing frequently cuts from subject to painting thereby allowing us to make comparisons, and finally a dissolve matches the subject to the finished work, a nice touch which mimics an artist's own final glance of assessment. 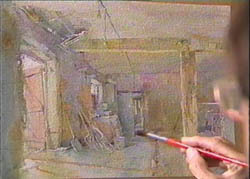 It is tempting to compare videos in general with books which demonstrate painting techniques. Each expose the limitations of the medium but each have their own value. In praise of the book, one can refer to it easily even whilst painting, whereas the video requires one to break off from the process and then find a particular place on the tape (usually a frustrating experience!) However, where the video scores over its rival is in its ability to show movement. Whilst David Curtis tells us nothing about drawing his subjects before he applies the paint, nor about selecting a viewpoint or planning the composition (and I suspect that a book might have done this), the speed and controlled freedom with which he applies his initial colour washes and the careful way in which he builds up the transparent layers, is something which only this medium can reproduce. And it is of the greatest value, for how often can we see a master at work. Arguably, it is the best way for us to learn. 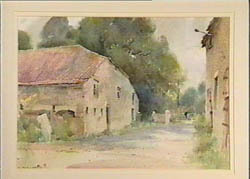 Light Effects in Watercolour by David Curtis. This is just the kind of video I had in mind in my opening remarks. David Curtis is excellent at showing us how he achieves a certain effect and also at talking us through it. His use of lights and darks is often subtle, for he likes to maintain the transparency of shadows, but they are always totally effective in creating a marvellous feeling of space and atmosphere. Painting outside in his native Yorkshire, he tackles a variety of subjects, including the interior of an old barn with the light streaming in through the door, and a boat builder's yard. Light Effects in Watercolour by David Curtis. This is just the kind of video I had in mind in my opening remarks. David Curtis is excellent at showing us how he achieves a certain effect and also at talking us through it. His use of lights and darks is often subtle, for he likes to maintain the transparency of shadows, but they are always totally effective in creating a marvellous feeling of space and atmosphere. Painting outside in his native Yorkshire, he tackles a variety of subjects, including the interior of an old barn with the light streaming in through the door, and a boat builder's yard. I've watched this video so many times and just watched it again! As always, I was thrilled and inspired and learned many new things I can't believe I missed before. You can come back to this video again and again and always make a discovery. It makes it so worth the purchase price as it can be used through the years as a guide while your own painting is improving. It is beautifully filmed, David's words are delightful and the painting's are as lovely as you can imagine. 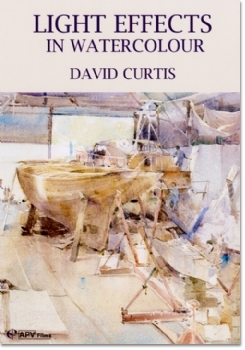 I love it and the two other David Curtis videos that I have, and highly recommend it for all levels of painters.